The flavors of frozen yogurt available that day were vanilla, death by chocolate, peanut butter, plain, strawberry, raspberry, taro, grape, lychee and almond. We started off sampling a few and really enjoyed the creamy texture as well as the way the flavors worked with the naturally tart bite of yogurt. The taro and almond flavors were especially tasty and both of us went for a combination of the two. Our approach to toppings was different, however. My friend went simple with the above, though, the wide variety of sweets and chocolate toppings was tempting to him. Cinnamon toast crunch on frozen yogurt?! Mind blown. I explored the fruity toppings available, adding some sliced almonds and crushed waffle cone for crunch. The pineapple, mango, strawberries and kiwi were all fresh and ripe, unlike other places I'd been. 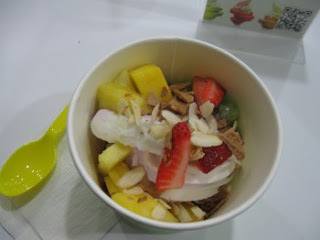 The taro & almond frozen yogurt combination worked with them excellently (if I do say so myself). 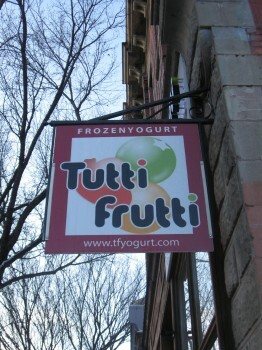 I've visited other fro-yo places with the same create-weigh-pay concept, but Tutti Frutti really stands out because of the quality of their frozen yogurt. No matter what toppings you load up on, the backbone is still the fro-yo, and I think some other places forget that. The variety of fro-yo flavors, fruits, jellies, chocolates, candies, cereal, nuts, sprinkles, and syrups available offers customers a seemingly infinite variety of ways to get creative -- and lots of reasons to keep coming back.